Ken Griffey Jr. has agreed on a deal with the Seattle Mariners to head back to the left coast to presumably finish his career with the same team that he began it with. This is an interesting move, and it makes me have a little more faith in the loyalty of today’s ballplayers. Though the interesting part of this story is not that Griffey is going back to Seattle, it’s why Griffey is going back to Seattle. “We are revitalizing this franchise. He brings something to the table there,” Zduriencik deadpanned after he made his biggest splash yet while trying to resurrect the Mariners. Now is it just me or does it seem a little rediculous to think that Ken Griffey Jr., the 2009 Ken Griffey Jr., will be the one thing that revitalizes the Seattle Mariners? This may have been true if it were the 1990s Junior, but alas, it is not. He’s old. He’s tired. He’s been seen sucking on Werthers Originals in the dugout. 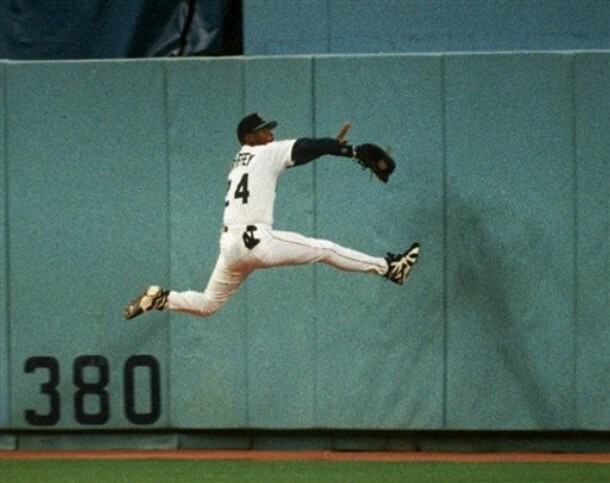 Griffey will go to the HOF as a first balloter, and it’s great to see a player of his stature possibly end his career with the team that started it. But for him to be the biggest move the Mariners have made this offseason, and have their hopes of revitalizing a franchise on a player that was a rookie when the Berlin Wall came down does not seem like the best bet. You are currently browsing the archives for the Ken Griffey Jr. category.